"It snows this morning !" When my wife said so, I got up soon and saw outside. Yes, there were a lot of snow around our Pension. "I go to take photos." After I said so, I went to the beach with my camera. 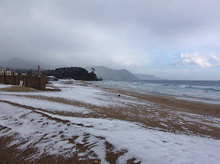 I could take a photo of snow in Shirahama beach after about 10 years. This entry was posted in nature on 2006年2月4日 by izusakuraya. When I got up this morning it was very cold in Shirahama, because it snowed. "When does the spring come this year?" When I saw the snow this morning I thought like that. But the spring had already come in Kawazu town next to Shirahama. 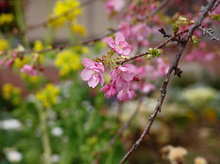 This entry was posted in Flower, Travel on 2006年2月4日 by izusakuraya.